John Butcher, husband of Charlotte Butcher had his licence application refused September (1851?) and again upon appeal October 1851. He had applied to take over the house because Mrs. Butcher, who held the licence was living in a state of concubinage with Robert Barnaby. Barnaby had also applied for the licence but his bad character had prevented it. Barnaby denied that he knew Mrs Butcher as a prostitute. The Bench were reminded that three convictions were required to refuse a licence and although Mrs Butcher was in a state of concubinage with Barnaby, they could not interfere. At the sessions held Thursday 2nd September 1852 Mr. Butcher again applied for licence renewal, four magistrates were in favour of granting the suspended licence and five against it. On a show of hands the licence application was refused. At the Licensing Sessions held 2nd September 1862 it was heard that it was kept by John Beverley. The (full) licence had been previously withdrawn from Mr. Barnaby since he was not married and not a fit and proper person to keep the house. Since Mr. Barnaby no longer had any interest in the house and because the current applicant was said to be a respectable man he was fairly entitled to have the licence renewed. 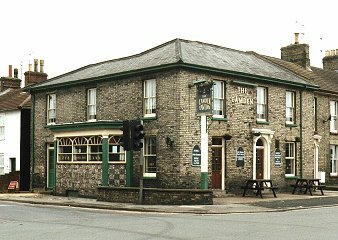 The Mayor said that there were four similar houses within one hundred yards of the CAMDEN ARMS and if a licence were granted here, they would all want one. Although it was said that there had been no convictions against the house, the Mayor affirmed the contrary. The licence was refused. Closed for the duration of the war according to a letter dated 22.08.1941, however the house reopened 28.07.1942 owing to the closure of the QUEENS ARMS due to enemy action. Request for planning permission to convert into flats published 7th February 2014.